Is FESPA Eurasia 2019 free to attend? Yes, if you pre-register using one of the promotional codes found on adverts and marketing promotions. When will registration go live? You can register here today. Where do I find a code to register? 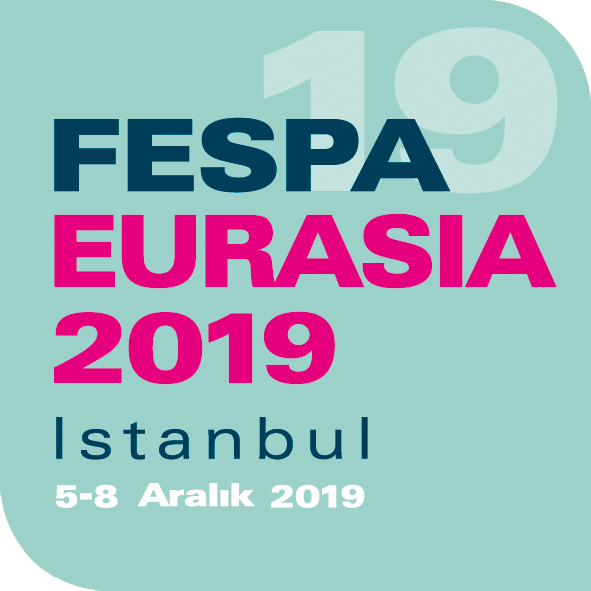 FESPA Eurasia 2019 is a trade show, presenting business opportunities, networking and sourcing for individuals and companies within the screen, digital and textile printing and signage communities. A must-visit if you are an international or local printer, a designer, print buyer, retailer, interior designer, fashion brand or print professional, FESPA Eurasia 2019 offers the very latest products, innovations and information from over 500 brands. Is this event suitable for children? No, FESPA Eurasia 2018 is a trade event for professionals with live machinery, so any persons below the age of 16 will not be permitted - including babies in arms. Can I visit as a student? All students are welcome – please note you must register for a ticket to attend. For group visits, please contact the marketing team. Where does FESPA 2019 take place? Which entrance should I use? Upon arrival at the venue, head to the main entrance which will lead to hall 9-10. From the 29th October 2018 Istanbul’s brand-new airport will be open. Please be aware that all flights will be diverted here from Ataturk Airport from the 31st October 2018. There are direct flights from most major European, Middle Eastern and Asian cities. Passport holders from a number of countries require a visa to enter the Turkish Republic. Simple visas can be purchased online prior to entering the country which saves time queing at the airport, just ensure you take a printed copy with you for your travel. There are several parking facilities located onsite for free, for visitors travelling by car. Where can I book a hotel room? Please click here to discover the many hotels which are conveniently located close to the venue. The exhibitor list for FESPA Eurasia 2018 will be updated shortly. Which products will I be able to see? To find out more about exhibiting at FESPA Eurasia 2019, please click here to complete our stand enquiry form. A member of our sales team will contact you shortly. To gain free access to FESPA Eurasia 2018, simply find and use one of our promotional codes which can be found across all our marketing collateral, including social media, mailings, emails and fespa.com articles. ALL promotional codes will begin with 4 letters followed by 3 numbers i.e. EURZ072 *this code is not live. Important notice: FESPA Eurasia 2018 will not permit any persons under the age of 16 into the exhibition as there will be live machinery in operation. This includes babies in arms. Identification will be required where deemed necessary.